I will be the first to concede that my writeups for the fourth season of The Simpsons have so far been suspiciously devoid of criticism. That is for a very good reason: they don’t give writers, or slobbering fanboys, as it were, a whole lot to criticize. So it’s almost a relief to encounter an episode that allows me to be critical instead of fawningly reverent. “New Kids On The Block” is a typically strong episode of The Simpsons, but it’s the rare fourth-season episode that doesn’t completely live up to its potential. The Conan O’Brien-penned half-hour has the capacity to rip our collective hearts out the way the cute, funny bad girl next door does to Bart when she reveals that her new boyfriend is Jimbo Jones, but the show keeps shying away from genuine emotion in favor of jokes that, while overwhelmingly funny, detract from the poignancy and the emotional intimacy of the episode. The episode also opens with an inspired bit of business for Homer, who blithely refuses to acquiesce to an elderly neighbor’s utterly reasonable request that he help make the process of selling her house easier by wearing pants when he gallivants about in front of windows, throw out his impressive collection of rotting Jack-O-Lanterns from previous Halloweens and take out his garbage, as it’s attracting wildlife (cue moose and Northern Exposure theme song). But my favorite line of the sequence, and possibly the entire episode, is Homer asking his deeply irritated elderly neighbor, “Trying to run out the clock in Florida, eh?” That’s such a brutally funny, boldly unsentimental and coldly true bit of dialogue. The neighbor is eventually able to sell her home despite Homer’s pants-less affronts to propriety and decency and Bart falls deeply and instantly for one of its new inhabitants, a tough but charming and funny tomboy girl named Laura (voiced by Sara Gilbert) with just the right combination of toughness and sweetness, granite and honey. This newfound infatuation renders Bart uncharacteristically vulnerable. He suddenly has something to care about beyond causing trouble and makes a dramatic transformation from hell-raiser to gentleman about town. In a desperate attempt to impress Laura, Bart begins bathing and sashaying about in a smoking jacket while sucking thoughtfully on a bubble pipe as part of his new pint-sized Hef persona. Bart eventually gets Laura to babysit while Homer and Marge eat at the Sea Captain’s all-you-can-eat seafood joint, The Frying Dutchman. When Laura tells Bart that she can teach him to dance, Bart and Laura are suddenly transformed into Astaire and Rogers in a black-and-white fantasy sequence before Bart’s reverie is abruptly ended when Laura reverts back to bratty tomboy form and gives him a wedgie. It’s a lovely sequence cut too short because the show seems afraid to give itself over to romance and whimsy and wistfulness when it has wedgie jokes to deliver. The animators, writers and Gilbert do a fantastic job of making Laura an eminently crush-worthy figure of adolescent yearning but the episode doles out scenes of her and Bart together sparingly. In a bid to understand the eternal mystery that is woman, Bart goes to the least qualified possible source for advice and counsel: his father, who remarkably seems to have made it to his mid-30s without quite figuring out much of anything. Hewing to the old comedy convention of beginning a speech by randomly referencing something in eyesight, Homer begins his talk about the birds and the bees by saying that women are like refrigerators: they’re all about six feet tall and weigh three hundred pounds and make ice cubes. When that metaphor proves untenable, he switches to insisting that women are like beer but that’s mainly as a pretext to drink until he passes out in a father-son bonding haze. 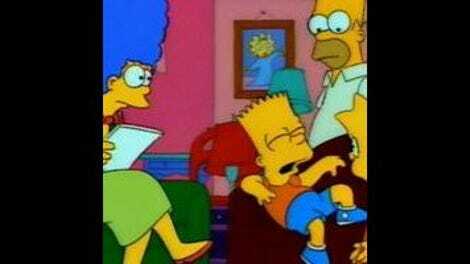 It’s a funny scene but the episode might have more emotional resonance if Homer took his son’s sensitive emotional state even a little bit seriously. Ah, but the worst is yet to come for Bart. When Laura stops by Bart’s window looking impossibly glamorous and beautiful and tells him to meet her later he’s primed for all his dreams to come true. Instead, he’s instantly thrust into his worst nightmare when Laura reveals that she doesn’t just have a boyfriend; her boyfriend is Jimbo Jones, one of Bart’s worst tormentors. Bart is predictably devastated, but the plot thread wraps itself up all too neatly when Bart gets Laura to see through Jimbo’s bad-boy façade by framing Jimbo for one of his own habitual crank calls to Moe. When Moe comes to the Simpson home with a shotgun and Jimbo breaks down and begins weeping in fear, Laura no longer wants anything to do with him. These two threads come together when Bart and Laura crank-call Moe’s while Homer and the Sea Captain are enjoying a conciliatory brew together and Laura tells Bart that if he were able to grow a creepy teenaged mustache she’d totally go out with him. However, in order for a show about youthful infatuation to ring true, it should end with pain and hurt, not a happy ending. “New Kid On The Block” is spectacularly funny but some of its big laughs come at the expense of deep, stinging emotional resonance. The joke of Homer mistaking a crude double entendre for talk about food gets a little old here, it pains me to say. Up next is “Mr. Plow.” If memory serves, that’s a good one.